Memento's Watch app offers much of the same utility as Apple's own Reminders for watchOS, with a minimalistic approach that provides easy access to your task lists, the ability to check off todos, and quick launching of the app via complications. In addition to housing each list you've created, Memento's Watch app also includes a For You list containing all your upcoming scheduled tasks. For You is laid out just like Reminders' own Scheduled list, with today's due tasks followed by tomorrow's, then the next day's, and so on. It's a good one-stop destination to see what's on your current and upcoming agenda. Design-wise, I like how Memento's Watch app looks overall; it's more attractive than Apple's Reminders while still retaining a similar simplistic feel. However, my one complaint is that task cards are so large that you typically can't see more than one on-screen at a time. This increased size relative to Reminders makes tap targets easier to hit with accuracy, and contributes to the visual strength of the app, but despite those benefits it still feels like an inefficient use of screen space. 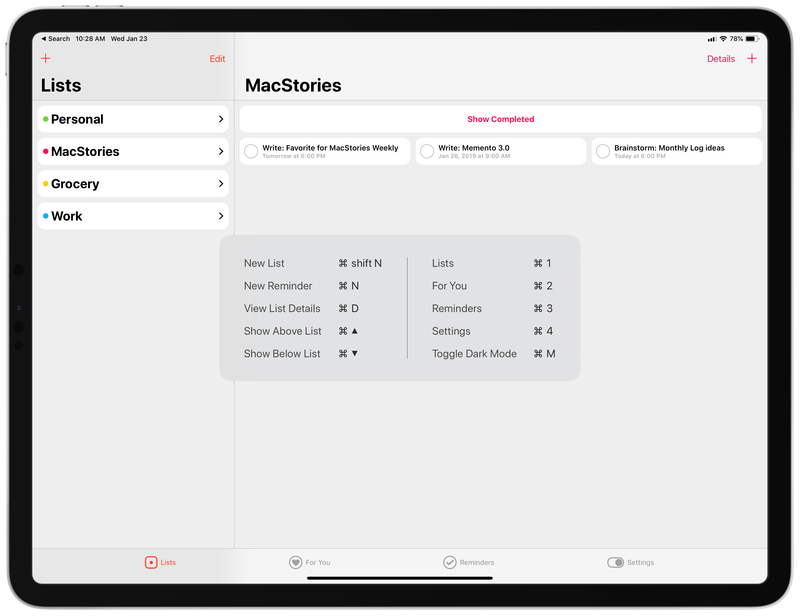 In addition to bringing Memento to the smallest Apple display, the Watch, today's update also includes a welcome improvement to the app on big screens like the 12.9-inch iPad Pro: keyboard shortcuts. Though not extensive, the shortcuts in Memento make for easy navigation between the app's four main tabs, enable easy toggling of dark mode, creation of new tasks and lists, and movement between different lists. Though I'd love to see every pro iPad app adopt the kind of comprehensive keyboard support found in Things, Memento's shortcuts are nonetheless a valuable addition. Task managers are meant to help users get things done, not overcomplicate matters to the point where adding new tasks or organizing existing ones becomes a full-time job itself. That's why I always appreciate when apps include convenient shortcuts for adding task metadata, such as a due date. Memento previously did well in this area by having preset due days and times you could choose from with a single tap – there were options like this evening, tomorrow morning, and next week. Reminders, by contrast, only offers a standard scrolling date picker for tasks; it's not a bad system, but it's not as quick or convenient as preset options. In version 3 Memento is making its time presets entirely customizable, so you can add, remove, or modify which options appear every time you enter the alert setting screen. Though I found the existing collection of presets covered most of my needs, I've created a couple new ones that delay a task either two or three days beyond its current due date. This way, when I come across a todo on any given day that I know I won't be able to get to until later in the week, I can reschedule it with a single tap. 3D Touch. On compatible iPhones, you can now use 3D Touch on a task from any part of the app, which will show you more detail about that task. More importantly though, with 3D Touch and a swipe up, you'll see a handful of buttons to perform actions like Edit, Change List, and Delete. Automatic dark mode. Memento is one of the few apps I've used that includes really attractive dark and light modes, making it hard to choose just one to stick with. Fortunately, the new automatic dark mode feature solves that dilemma by switching between light and dark modes at 9:00am and 6:00pm local time, respectively. Tappable links in notes. If you save links in a task's note field – whether URLs, dates, phone numbers, or locations – those links will now be automatically detected by Memento and made tappable. As Apple's Reminders app stagnates year after year, third-party apps like Memento continue improving and offering designs that fit in well with modern iOS aesthetics. Today's improvements make Memento an even more appealing alternative for those ready to move on from Reminders, or who want the benefits of a third-party app without giving up the comfort of integration with Apple's ecosystem.